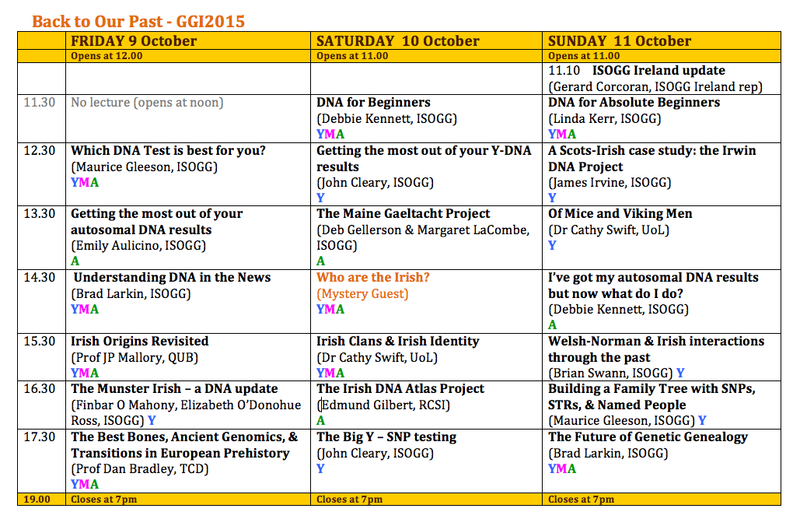 In the previous post we looked at the schedule for Day 1 of the DNA Lectures at GGI2015 at Back to Our Past. Now let’s take a look at Day 2 (Sat 10th Oct). 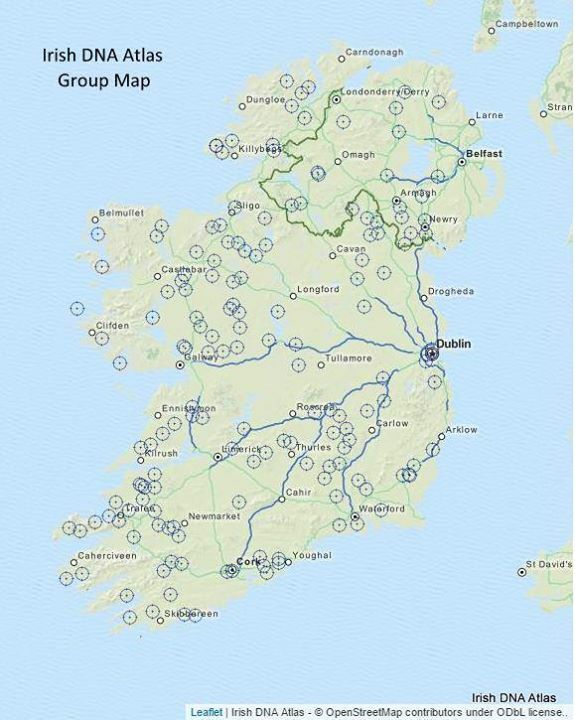 The genetic genealogy community has been eagerly awaiting the results of the Irish DNA Atlas Project, which began recruiting to their study at Back to Our Past 2011. Four years later and the first results are now ready to be revealed. 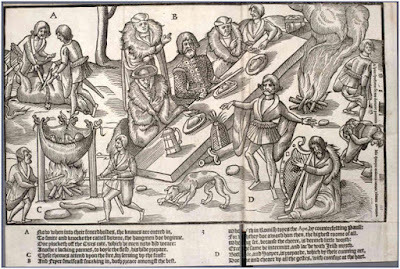 Dr Ed Gilbert (RCSI) will be presenting the initial results from the project (based on 173 participants) and will discuss how they compare to those of the People of the British Isles project and other European studies. It is great to see the project starting to bear fruit, but these are just initial results and recruitment to the project is ongoing. 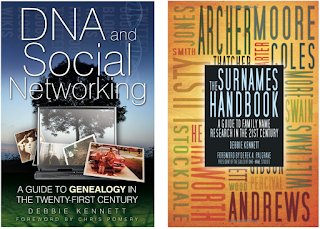 You must have 8 great grandparents from the same general area (e.g. 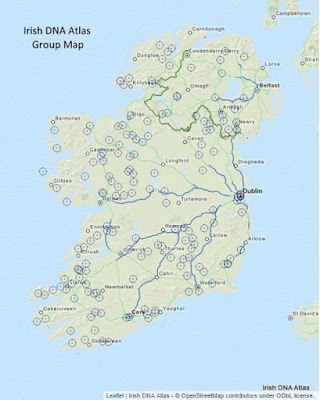 30km radius), so if you think you meet the criteria be sure to contact Seamus O'Reilly at Irish.dna@familyhistory.ie. It is hoped that up to 600 people will be enrolled. Currently they are looking for a lot more recruits from the following Irish counties: Laois, Offaly, Longford, Roscommon, Leitrim, Meath, & Limerick. It is a great pleasure to welcome back Dr Cathy Swift to GGI2015. Cathy is Director of Irish Studies at the University of Limerick and gave an excellent presentation last year on the surnames of Munster and the genetic associations with the clan of Brian Boru - a fitting tribute to the High King seeing as how last year was the millennium of the Battle of Clontarf. 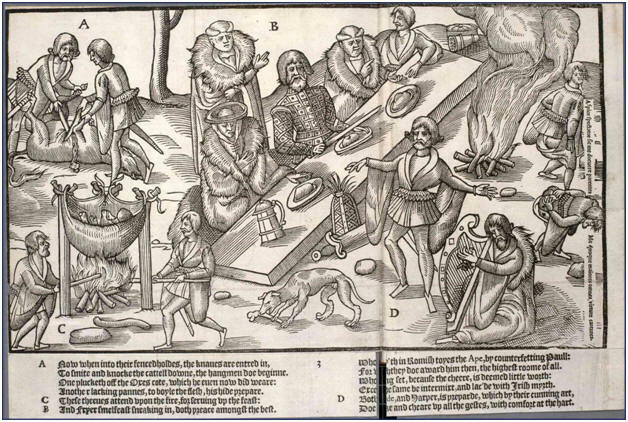 Cathy will be speaking on the topic of Irish Clans and Irish identity, a topic that she finds fascinating, and one that is completely in keeping with this year’s conference theme: Who are the Irish? Cathy is an eminent Irish academic and her spirited presentations are not be missed. 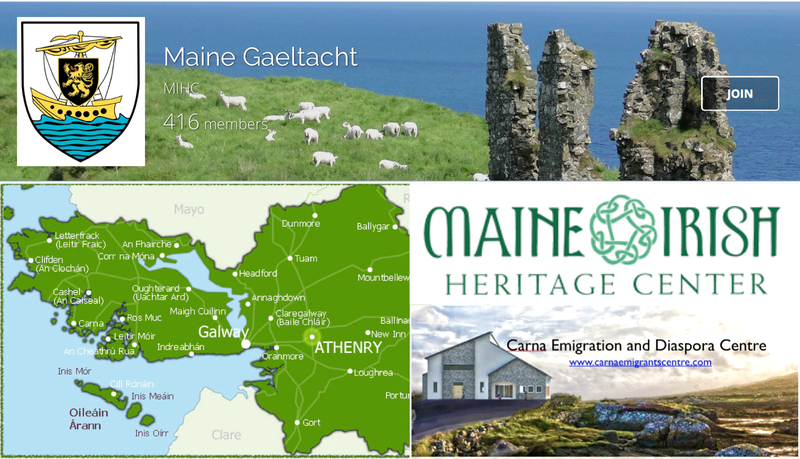 We are privileged this year to have several members of the Maine Irish Heritage Centre presenting the incredible work they do, in close collaboration with the Carna Emigrants Centre, on the Maine Gaeltacht DNA Project. This is a fine example of how an autosomal DNA project can be used to reconnect people with ancestry from a specific localised area, and in this instance the area is the southern part of County Galway, stretching from Spiddal in the east to Carna in the west. This particular part of Connemara saw entire villages leaving for the US in the latter part of the 1800’s and the early part of the 1900’s and settling in a relatively small area of Maine. The project has collected hundreds of pedigrees from people with ancestry from this area and has over 130,000 individuals within their database as well as 400 people tested for autosomal DNA. This project could well serve as a template for other similar “Geographic Autosomal Projects”, not just in Ireland, but anywhere in the world. 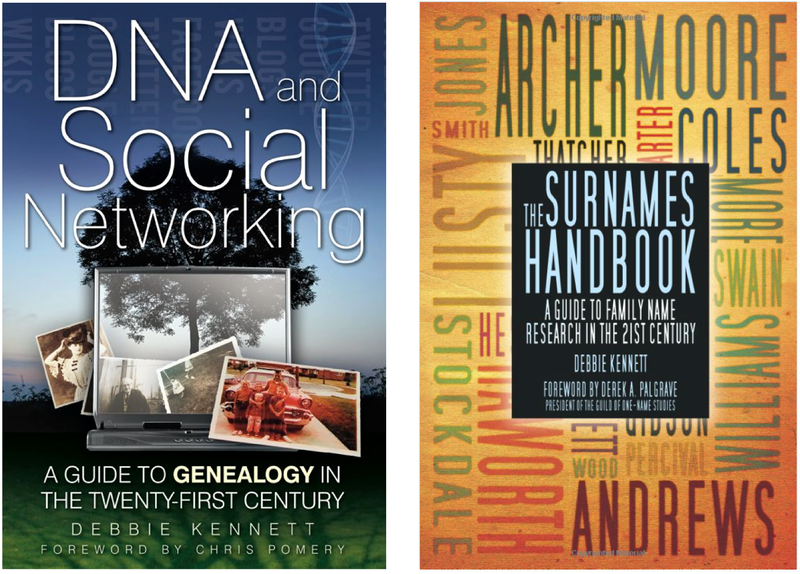 For the "first-timers” and those who are new to DNA for genealogy, we are lucky to have one of the most knowledgable and most experienced genetic genealogists in the world giving a talk on DNA for Beginners. Debbie Kennett is a popular blogger, author of several books, Project Administrator for several DNA Projects, editor of the ISOG wiki, and an Honorary Research Associate at the University of London. Where does she find the time! 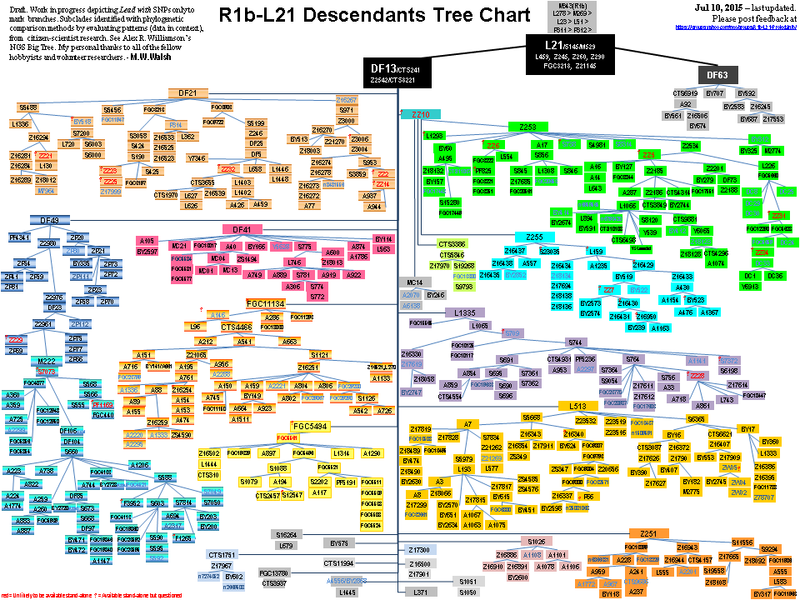 Debbie’s clear and concise explanation of the basics of DNA testing and how it can help your genealogy is essential listening for any newbies (and for quite a few of us seasoned genetic genealogists too). Another wonderful speaker is John Cleary, who will be gracing us with two presentations on the Saturday. His first talk will give some very practical advice and guidance on how to get the most out of your Y-DNA results. John has an excellent presentation style and has the ability to reduce complex topics into language that is understandable by all. He will discuss how to interpret your Y-DNA results, why you should join both a surname project and a haplogroup project, and the particular benefits of joining a geographic project or a special interest project, such as the fascinating one he runs for the descendants of the Scottish Prisoners (a group of captive soldiers sent by Cromwell to the New World in the mid-1600’s). John will also be discussing SNP testing and the Big Y test in particular. It is now 2 years since this test was introduced and we have now been hit by the first wave of the SNP tsunami. But where has this left us? What new discoveries has it allowed? What new challenges has it presented? And what does the future hold for SNP testing? These and more fascinating questions will be addressed by John in the final talk of the day. And last but not least, we have the Mystery Guest. I am not at liberty to reveal who this person is, but you can be guaranteed that this particular presentation will challenge your concept of what it means to be Irish ... you may be more Irish than you ever imagined! Who is it? Time will tell. 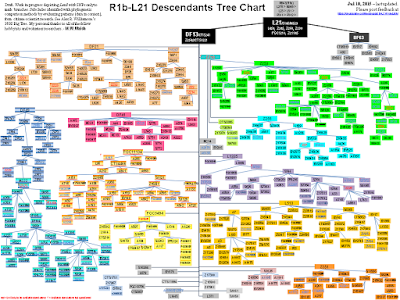 * The descendant chart is courtesy of Michael W. Walsh, whose ancestors come from Ballyhale, Co. Kilkenny, and were known as "Walsh of the Mountain"
It's hard to imagine a better group of talks for beginners and more expert genetic genealogists. There is quite a line up and much to interest people of Irish ancestry. This will be my third BTOP and looking forward to it.